Only two blocks off of Main Street (8th Street), the Payette River is a significant natural amenity that can contribute to the city center’s success. See Payette River, page 25. Currently, the Payette River seems rather forgotten; its east river bank along Kiwanis Park, for example, is unimproved. No access or viewpoints exist to tie the park to this beautiful crystal river that is the life-blood of the area’s agricultural empire. Because the Payette River is a major asset to the city center and the city it is recommended that the east river bank from Kiwanis Park to 3rd Avenue North be developed as a river greenbelt. As illustrated in Figure 39 most of this area is undeveloped and within the 100-year floodway. Improvements would include a pedestrian and bicycle pathway, viewpoints, and natural low maintenance landscaping. It may even be possible to construct a small bridge from the river’s edge to the narrow island that runs adjacent to Kiwanis Park. The Payette River Greenbelt would serve as a recreational resource for the city, offering opportunities for walking, bicycling, fishing, wading, picnicing, and general relaxation. 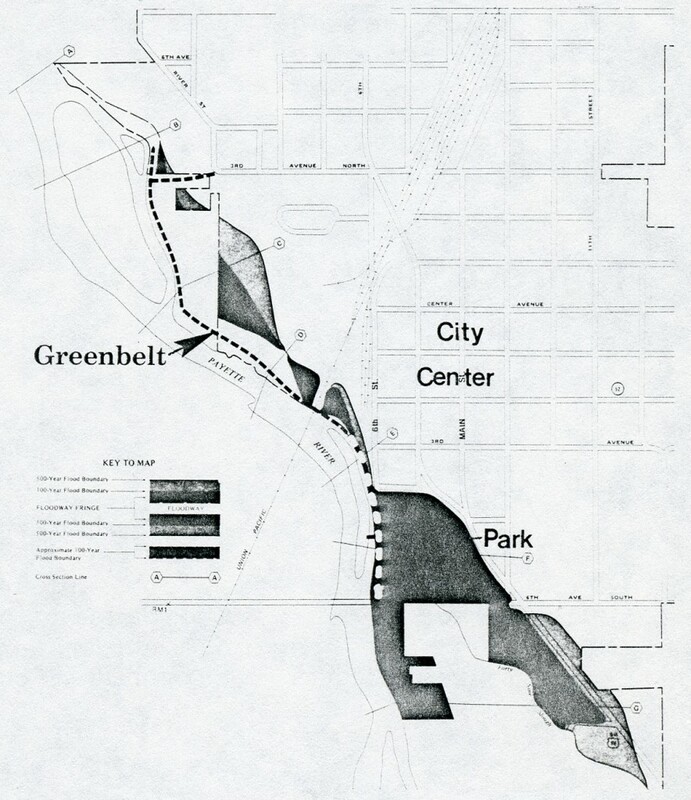 The greenbelt would also connect Kiwanis Park and its swimming complex to the city’s west side neighborhood. Initially, a greenbelt plan would be required to identify the path’s location as well as special opportunities and costs. Implementation of the greenbelt would occur with the help of various civic groups and the city. Potential labor could come from the Summer Youth Community improvement Project and funding may be possible through a State Park’s Land and Water Conservation Fund grant.